Denise Donatelli, a multiple Grammy Nominated Savant recording and international concert artist, has become one of today’s premiere vocalists. To date, she has recorded four albums and her recordings have collectively garnered three Grammy nominations. An East Coast native and recipient of classical piano training, she turned to singing jazz. A decision to move to Los Angeles in 2000 put her in touch with some of the city’s stellar musicians including Neil Hefti. Described as a musician's singer by Grammy Award winning saxophonist, Phil Woods, Denise has performed as guest vocalist with Roger Kellaway, Terry Trotter, Christian Jacob's Big Band Theory, Alf Clausen's Jazz Orchestra, Les Hooper's Big Band, the Stan Kenton Alumni Band. Denise recently released her 5th CD, Find a Heart, received a 2016 Grammy nomination for Best Jazz Vocal CD. This album includes including music by David Crosby, Beck, Donald Fagan, Journey and Sting, among others. The music included in Find a Heart been arranged and produced by Geoffrey Keezer. Denise’s band on this recording consists of Geoffrey Keezer, piano; Leonardo Amuedo, guitar; Carlitos del Puerto, bass; and Marvin “Smitty” Smith on drums. Trumpeter Chris Botti and saxophonist Bob Sheppard are among the featured artists on this CD. Denise's 2012 release, Soul Shadows received a Grammy Nomination for Best Jazz Vocal Album, the second consecutive nomination in that category of her recording career. Her 2010 release When Lights are Low received two Grammy Nominations, one for Best Jazz Vocal Album and another for Best Arrangement Accompanying a Vocalist for pianist and collaborator Geoffrey Keezer’s arrangement of Don't Explain. In 2008, Denise recorded her second CD entitled What Lies Within. The record garnered uniformly high praise from critics and casual listeners alike making it to the top ten of the Jazz Week Radio Chart and in 2005; her first recording In the Company of Friends brought her critical acclaim. Additionally, Denise makes a vocal appearance on the Christmas recording, That Time of Year (2011) by Grammy Award Winner Bill Cunliffe. In addition to her Grammy nominations, The Los Angeles Jazz Society has honored Denise with the 2012 Jazz Vocalist of the Year award. Voting advisors include John Clayton, Herbie Hancock, Quincy Jones and Johnny Mandel. Donatelli’s innate musicianship and pure tone have won her spots singing for episodes of The Simpsons, television promos for Frasier, Card Sharks and Turner Classic Movies and has appeared in national and international commercials for CNN, Hyundai, Lexus and Mercedes-Benz among others. Possessing a voice of exceptional nuance, agility and unerring pitch, Denise is able to imbue whatever she chooses to sing with her special warmth, wit and insight. She tours extensively, performing at jazz festivals, jazz clubs, performing art centers, and with university jazz bands where she conducts master clinics. 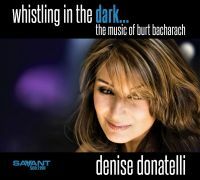 "With so many jazz vocalists competing for attention, Denise Donatelli easily stands out from the pack with her versatile, creative repertoire and strong voice." "The field of jazz vocals has been needing a fresh approach, and Donatelli's sharp focus here on pop-oriented songs delivered in a contemporary jazz manner brings that. The caveat here is that she steps far a field of the maudlin state of 'contemporary jazz,' making something that might be seen as a savior to adult contemporary music."